The Squadron was visited by the Commander in Chief, Bomber Command, Air Marshal Sir Norman Bottomley KCB, CIE, DSO, AFC. He was accompanied by E S Goodwin, CB, OBE, Air Officer in charge of Administration, Bomber Command, and was met on his arrival at RAF Graveley, Air Officer Commanding No 3 Group, Air Commodore Hesketh, CB. OBE, DFC, Group Captain RCM Collard DSO, DFC Officer commanding No. 35 Squadron Detachment, and Wing Commander Mathews, of HQ No3 Group. 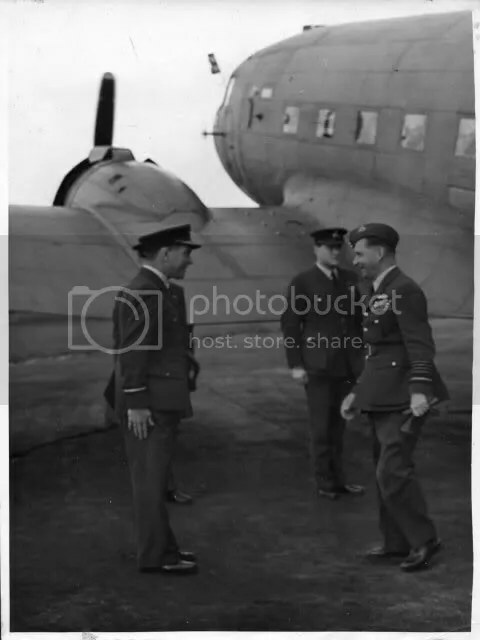 The Commander in Chief arrived at 10.00 am On leaving his Dakota aircraft he inspected a Guard of Honour en route to No.1 Hanger, The Squadron Detachment was drawn up as 3 flights in a hollow square in the Hanger. The Commander in Chief then addressed the Squadron. He said that the high standard of flying shown by the Squadron on VE Day if kept up in the USA would find no adverse criticism in that country. He offered his congratulations to the Squadron on its being chosen to represent not only Bomber Command but the entire RAF. The Commander in Chief also touched on flying discipline and in particular to discipline, bearing, and behaviour, on the ground, on and off duty, but said he hoped we would enjoy to the full when the opportunity presented itself. The amusements and entertainments which would be arranged for us by the American people and the members of the USAAF. 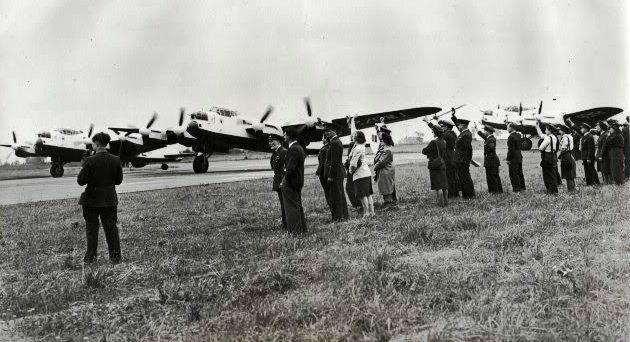 He called on all personnel going on the tour to do their utmost to uphold the high standards of British Aviation and British Equipment and also stated that he felt sure the Squadron by its excellent flying and ground discipline would uphold and enhance the traditions of service in the RAF. He told the Squadron they were going to a great country to visit a great people and that the resources we saw there were the same great resources which were freely applied to our needs when this country was in desperate straits during the early part of the War. Air-crew on parade Graveley, 3rd July 1946. Note guns still present in the front turrets and the squadron badge on the side of the cockpit of front replacement Aircraft TL-S PA835. The crews were sorry in a way that they were not flying the Lancasters that they used during the war which were being scrapped hurriedly. 6th July 1946. Chief of Air Staff, Lord Tedder in forage cap visits Graveley. Tedder of Carpet Bombing fame is on the right with W/C Craig at attention (centre). The Dakota was C in C Bottomley’s aircraft. On Portal‘s retirement as Chief of the Air Staff, Tedder was appointed to replace him at the beginning of 1946 then handing over the post in 1950. Tedder was married to Rosalinde Maclary, who died in 1943. At Rosalinde’s request, Tedder married again, to his young service driver, “Toppy” Seton. In his last years, he became severely crippled with Parkinson’s disease and died at Well Farm in Banstead, Surrey, England, on June 3, 1967. The Squadron A & B Flights left RAF Graveley in 2 waves on 8/9th July and were routed via St Mawgan Cornwall, Lagens the Azores to Gander, Newfoundland. On the 8th July 1946, ‘A’ Flight consisting of 8 Lancasters under W/C Craig departed Graveley for St Mawgan on the 1st leg of Operation Goodwill. The wives and family with many others came to see them off at the end of the runway. F/|Lt Kennedy, F/LT Howel, F/Lt Walton, F/Lt Cooper, F/Lt Felgate, F/Lt Davidson, F/Lt Walne, Sgt Tompkins, LAC Punt, F/Sgt Blake, LAC Trainer, also Mr Charles Gardner, Air Correspondent (Former War Correspondent) of the BBC . The BBC Broadcast a script read by W/C Craig on the day of his departure and a copy of the transcript was sent to him at Graveley awaiting his return from the Goodwill Tour. The 2nd wave ‘B’ Flight under S/L (Shorty) Harris left on the 9th July with a further 8 aircraft. F/O John Robinson (died in 1988) was on this tour and flew Lancaster TL-R which was involved in an accident on the return flight but then it was being piloted by F/L Peter Stockwell. July 11th – The 1st wave Flight A were recalled after 3 hours due to bad weather over Gander and went back to Lagens which was unfortunate as accommodation was very limited and it meant that now both Flights were stationed there at the same time. They both then progressed to Gander on 12th July after a 9-hour flight and spend some days there for pre-tour check-ups. The intended arrival route was Graveley – St Mawgan (Overnight Stay) – Lagens (Azores) – Gander (Newfoundland) for a pre-tour full maintenance then took off on the 17th July on a 6-hour flight to Mitchel Airfield, New York. A New York Flypast was made on July 18th and flew in Formation en route over Boston.